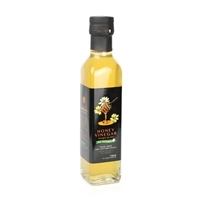 The Honey Bee Store carries all-natural Honey vinegars that are made from 100% Ontario honey. It is double fermented through a traditional fermentation process. No preservatives added. No sulfites. These all-natural Honey vinegars are made from 100% Ontario honey. They are double fermented through a traditional fermentation process. No preservatives added. No sulfites.